Without Mike Conley things are often very difficult for the Memphis Grizzlies, but a great performance from Jeff Green and Beno Udrih helped them beat the Portland Trail Blazers 102-98 in a big battle for second place in a very crowded Western conference. Green isn’t starting – the Grizzlies are keeping Tony Allen and his defense in the lineup, but Allen played just 18 minutes, once again looking like an unwanted figure on the court when the Grizzlies had possession. Green, however, scored 17 points in 30 minutes coming off the bench while Udrih, starting for Conley, scored 17 points to go with 7 rebounds and 3 assists in his best game of the season. 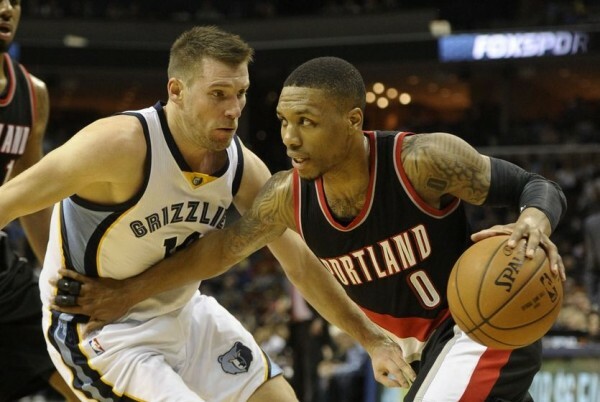 Damian Lillard tried a bit too hard to take advantage of not having Conley guarding him. He took 26 shots to score 23 points. Wesley Matthews was red hot with 7-of-14 from beyond the arc (25 points) and LaMarcus Alrdirdge scored 32 points as the Blazers cut down on the big Memphis lead in the third quarter to make a game of it. However, shooting 38.7% from the field and playing bad, uncharacteristic defense for most of the game left them in a hole too deep for them to get out of. As always, the Blazers were also thwarted by their bench, scoring just 11 points. From time to time the production from that unit varies and it does become useful, but too often it seems that when five or four players from the second unit are on the floor, Portland are really struggling to find a way into the basket. As good as their defense has become, without something more than their lineup giving points, it’s going to be hard getting over the threshold of being the 4th-5th best team in the Western playoffs. The Grizzlies have more depth and scoring off the bench than ever. It might take some time to do some defensive shuffling with Allen playing less minutes, but the additions of Green this season, Vince Carter in the offseason and Courtney Lee last season (another Boston trade) gives them a lot more range and ability to space the floor, which means not always counting on Zach Randolph and Marc Gasol to win the games by dominating the paint.